Of course, the relationship between video games and movie would lead to this, an animated film that reads on paper like Toy Story for video games. But Wreck-It Ralph is much more than that. Strong characters married with perfect voice acting choices have a strong hand in transcending the film past its obvious conceit and into something thoroughly endearing and very funny. While a references-for-references-sake path would have been easy and still funny, it's Wreck-It Ralph's sturdy hand in incorporating video game references into a lovable story that puts it at the top of this year's animated fair. The Wreck-It Ralph of the title is a video game villain, the baddy of a Donkey Kong-esqe 8-bit game where the hero, Fix-It Felix, Jr., consistently thwarts Ralph's schemes, but it's all in a day's work. At the end of the work day, Felix goes to his penthouse - suitable for a hero - and Ralph heads to his home in a nearby junkyard. But Ralph doesn't wish to be the villain any longer, and his quest to become a hero has him venturing out into the other games of their arcade home, seeking his true calling. The references found in Wreck-It Ralph kick in early with our would-be hero attending a support group for video game villains. Zangief from Street Fighter 2 is there as well as a few other notable, video game characters. The random zombie was a nice touch. But the film quickly moves past this and finds its arc, a villain who wishes for nothing more than to be honored and accepted as his nemesis, the hero, is. It's a story ripe for character development, and screenwriters Phil Johnston and Jennifer Lee along with director Rich Moore are all completely up for the task. 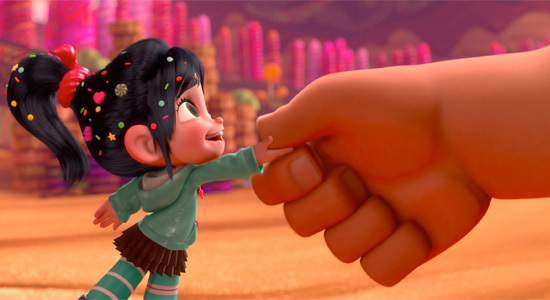 As with the best animated films, Wreck-It Ralph balances its humor with heart, both feeding off of each other and supporting one another throughout the film. When Ralph meets Vanellope von Schweetz, a glitch character who isn't accepted in her own kart racing video game, the characters are so likable and well developed that natural drama ends up building in their actions and conflicts. Never mind that they're video game characters realized through computer animation. These characters seem to have souls, and their every smile or ache is seen and felt in the audience. Moore and the screenwriters do a nice job building the secondary characters, as well, Felix and his infatuation with Sergeant Calhoun, a soldier in first-person shooter, bringing out some of the sweetest moments of the film. The characters and developments that go on in Vanellope's racing game tend to hang around a little too long, though. The filmmakers find their story in this magical world of candy race tracks and colorful characters, but once we're there, we stay there for the remainder of the film. What was once a fun journey through the circuits of various video games rests in this sugar-laden universe, as if Candyland The Movie didn't even need to be made any longer. Fortunately, team behind Wreck-It Ralph work their magic with even stagnant momentum, pulling energy from the characters and fine animation and throwing it all on the screen. And familiar video game characters pop up here and there for added texture, little reminders to the gamer inside all of us why we love some of these characters so much. Someone involved in this movie absolutely adores Q*bert, and no one can blame them. 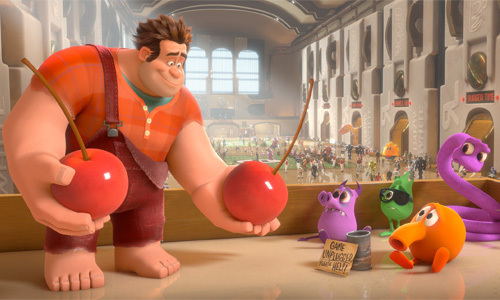 Much of that energy in the characters has to be credited to the voice acting here, and Wreck-It Ralph boasts some of the finest matches in voice-to-character seen in recent animated films. John C. Reilly is the perfect bellower for Ralph, while Sarah Silverman's squeaky pixie dreamgirl voice does wonders for Vanellope, a character who could have easily come across as annoying. 30 Rock's Jack McBrayer was the ideal choice for the awe-shucks Felix. But it's Alan Tudyk doing his very best Ed Wynn impersonation as King Candy, overseer of the candy-themed racing game, that shines brightest in a sea of genuine talent. His up-and-down delivery is spot-on and might have some wondering if Disney actually found a way to resurrect Wynn from the dead. They haven't, but Alan Tudyk fills in just fine. Add in the highly engaging theme of finding ones place in the world, and Wreck-It Ralph is best animated film of the year material, a film that is every bit as exhilarating as it is heartwarming. The scattering of video game references found throughout make for a fun guessing game, but this film is much more interested in telling an inventive and darling story than having its audience go "Hey, I know that character, too." That would have been the easy way to go with a story like Wreck-It Ralph's. As it is, though, the emotion and joy here is sure to make this film and the characters in it just as memorable as the video game characters of old. Bring on Wreck-It Ralph 64.
saw advance screening in Chicago with my kids. good solid family entertainment. my kids liked it but didn't love it. i felt the same. very well done. some of the video game culture references will fly past and over most people under 30's heads (fun to watch modern kids entertainment as an adult these days for me because the 80's generation is the driving creative force in the industry). Donkey Kong is talking to his lawyers right now about litigation.